I have a small collection of sansevierias, also known as mother-in-law, good-luck plant, bowstring hemp, and Devil’s tongue. 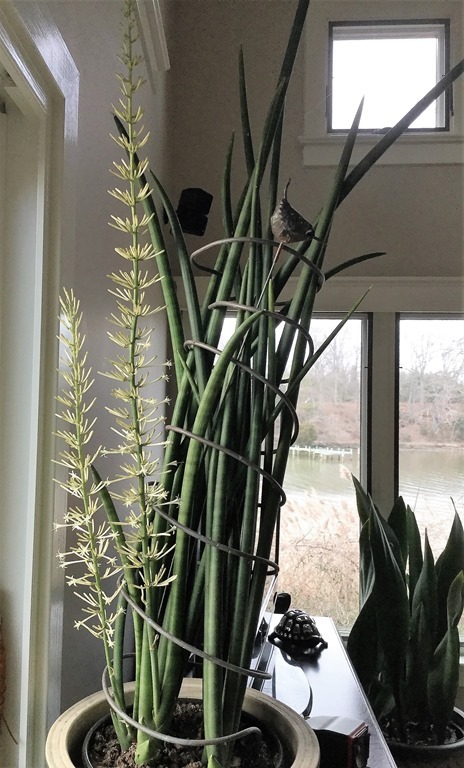 Year in and year out I enjoy them for their handsome foliage, but I am writing about them today because one of my more unusual plants is in bloom, Sansevieria cylindrica. Elephant’s toothpick and spear sansevieria are two of the common names I found for this plant. The flowers are creamy white, lightly fragrant, and open as the central stalk of the inflorescence lengthens. (Descriptions of this plant I found in reference books and on-line say the flowers are pinkish, but I don’t see that in my plant.) In my experience, sansevierias bloom on their own schedule, so I have learned to appreciate the flowers whenever they appear.